Author: Dibdin, Michael Set In . . . Description: In Italian police inspector Aurelio Zen, Michael Dibdin has given the mystery one of its most complex and compelling protagonists: a man wearily trying to enforce the law in a society where the law is constantly being bent. In this, the first novel he appears in, Zen himself has been assigned to do some law bending. Officials in a high government ministry want him to finger someone--anyone--for the murder of an eccentric billionaire, whose corrupt dealings enriched some of the most exalted figures in Italian politics.But Oscar Burolo's murder would seem to be not just unsolvable but impossible. The magnate was killed on a heavily fortified Sardinian estate, where every room was monitored by video cameras. Those cameras captured Burolo's grisly death, but not the face of his killer. And that same killer, elusive, implacable, and deranged, may now be stalking Zen. 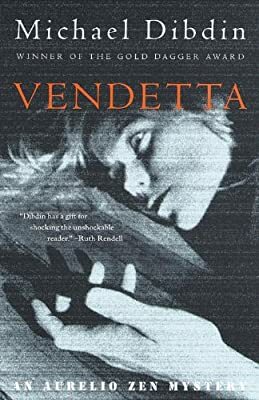 Inexorable in its suspense, superbly atmospheric, Vendetta is further proof of Dibdin's mastery of the crime novel.